The Brick Castle: Dr Beckmann Service-it Washing Machine Cleaner Giveaway with 10 Winners! 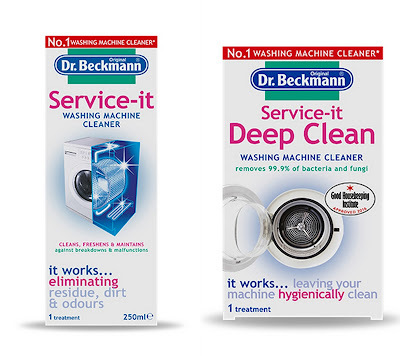 Dr Beckmann Service-it Washing Machine Cleaner Giveaway with 10 Winners! Dr Beckmann can be relied upon to clean all of those things we try to ignore - smells and dirt from washing machines and dishwashers, nasty stains on your clothes and those not-so-white net curtains. Still family owned and based in Bolton, the people behind Dr Beckmann have been making cleaning and laundry products for almost 100 years. My washing machine lives a very hard working life. 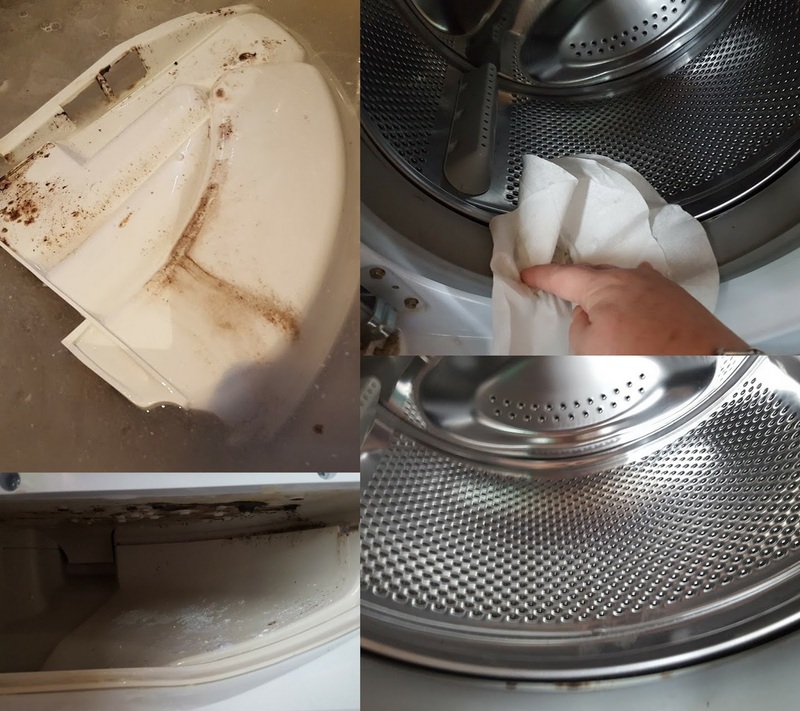 My previous machine lasted me 9 years and over 10,000 washes, so when I got my new Hotpoint washing machine almost 2 years ago, I knew I wanted to look after it as best I can. 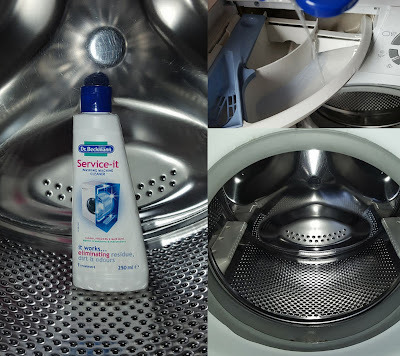 I regularly use Dr Beckmann Service-it Washing Machine Cleaner to keep my machine whiff-free and happy - in fact, I'm quite proud to say for once mine looked much cleaner than the one in the advert! 1. Remove the drawer and soak in around 50ml solution and 4 litres of water for 30 minutes. 2. Use a little solution on a cloth to wipe door seals. 3. When the drawer is done, put it back into the washing machine. Pour the rest of the solution into the cleaned drawer and set the machine running an empty washload at 60°. It really couldn't be simpler, and takes only a few minutes of your time - you don't even need to get your hands dirty. It's like cheating. It's almost as easy as cleaning your dishwasher - which I did on camera this time last year.. 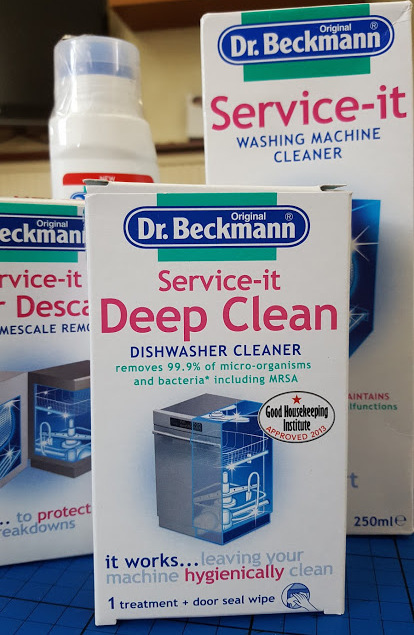 There are a huge range of Dr Beckmann products for your laundry, and floor and appliance cleaning - you can find them in most supermarkets, or buy online from the Dr Beckmann website (with free UK delivery on 5 products or more). To kick start your Spring cleaning, Dr Beckmann have offered 10 of my readers a Washing Machine Service-it pack each - with the Dr Beckmann Service-it Washing Machine Cleaner and the Dr Beckmann Service-it Washing Machine Deep Clean. To enter use the Gleam form below. The giveaway is open to UK entrants only and will close at midnight Sunday 19th March 2017. For full terms and conditions please see the bottom of the Gleam form. For help with Gleam and to see my other giveaways, please go to my Giveaways Page. No entry is mandatory, but they'll all earn you extra entries into the draw. 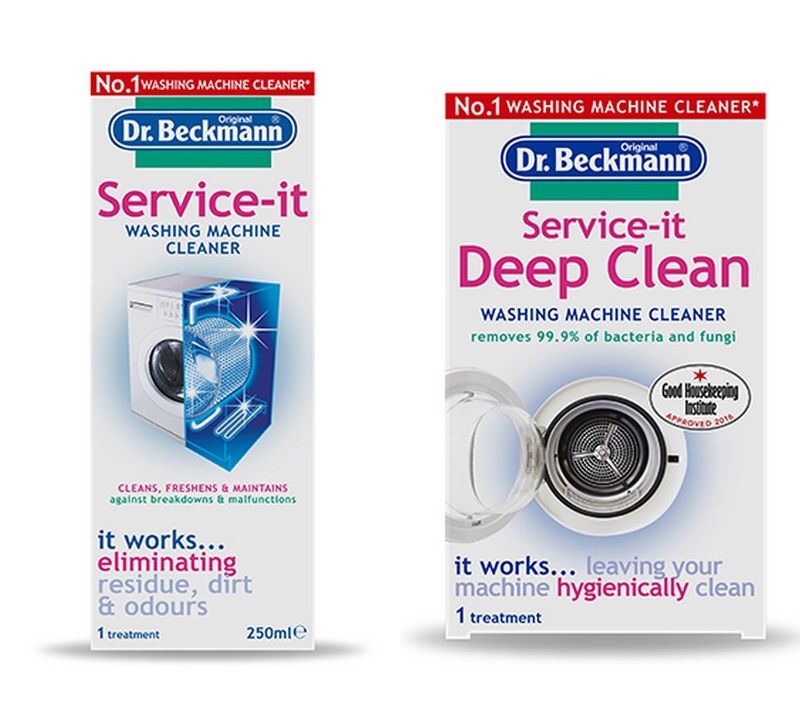 Dr Beckmann Service-it Washing Machine Cleaner Giveaway (10 Winners). I was paid for the time taken over this post. I wash colours on a lower heat setting, I was sheets and tea towels on a hot setting, I wash wool and silk on the lowest heat settings, I wash less dirty items on an economy setting at 40 degrees but more dirty items at a higher heat setting - so yes, I do change the settings according to what I am washing and I also change the spin settings too! I'm good and change my washing machine setting to match each load. I do use Dr beck man's, but maybe not as often as I should. Everything gets the same treatment, keeps things simple. I'm getting better as I have a big drum machine that can do half loads it's hard working out the best wash though. I rarely change the setting and wash most on the same one. I change my washing machine setting to match each load. Most of my wash is on 40.Whites i always wash on 60. I only use 2 or 3 settings - 40 degrees for most laundry, 30 for finer items, and long wash if laundry is particularly stained. I use mainly 2 or 3 settings - 40 for most laundry, 30 for finer materials, and longer wash for particularly stained items. I will admit to using mainly coloured wash at 40 for everything! I use different settings. My husband and I have quite a lot of delicates so I wash these on 25 degrees with other not so dirty things. I wash some other clothes at 30 if that's what it says on the label and everything else on 40. All of the colours go on the quick 60 degree wash and the white shirts go on the white cotton 95 degree wash! I only use one setting,40 degrees for a mixed load. I tend to use the whites, coloureds and towel settings. I wash most things on a 40degree wash and also use the handwash for woolens. I always choose the right setting for the wash i am doing, ATM i have a hot wash on as i have bedding in the machine. I wash nearly everything on one setting. I sometimes adjust the temperature, but I only really change the setting for washing shoes. I tend to use just one setting - 40 degrees. Have to confess, I mainly wash at 40 degrees. However, when cleaning machine with Dr Beckmans, I run machine at highest setting. I use 40 mixed for most washes...I'd love a machine that had a specific sports wash as gym clothes really don't like my machine's options. I'm terrible when it comes to my washing. I don't check pockets, I don't seperate my colours from my whites and I very rarely change the settings on my machine. I wash my whites on 60 and the rest on a 40 wash. Thanks for the giveaway. 40 is the setting I use the most for coloured and whites (not together obviously) sometimes if its more stained I use the prewash setting. For towels and bed sheets I use a higher setting. I tend to use the same two settings 40 deg & 60 deg. I'm bad for only using a 40° wash! I tend to stick to the same setting tho I do separate whites and colours. I change my machine settings to match each load. I just do the quick 30 min wash! Most things go on at 30-40 degrees. Towels, flannels, sheets and bedding go on a hot wash 60-80 degrees. I do try and change the settings. I tend to use one setting most of the time. Most of the times I just use the same setting. Mixed load on either 30 or 40 - never used any other settings. Daren't wash whites in mine as it's old and will leave oil marks over everything! I do use different settings for different washloads, and I try to use the lowest temperature where possible. I switch between 2 settings, either cottons (which is a long wash) or the 1 hour quick wash. It depends on how dirty I feel the clothes are. I use mostly mixed 40degrees and cotton 60 for whites and towels. I use a 40 degree wash most of the time but for t shirts and tops I do put them on a quick wash . I wash most clothes at 40. Jeans and towels I tend to increase the temperature to 50 or 60. When I remember I run the machine empty on a hot wash to flush it through.